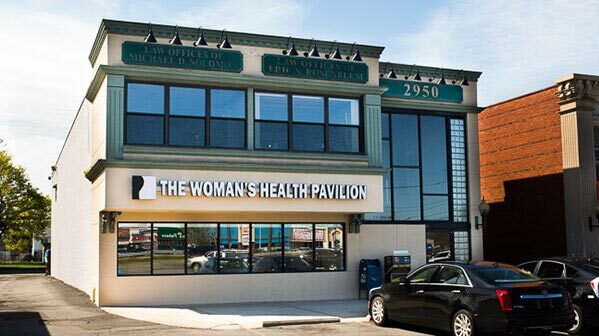 If you are looking for an exceptional OB-GYN practice and live in Bethpage, New York, The Woman’s Health Pavilion welcomes you. Our office in nearby Levittown offers a complete range of maternity and gynecology services 7 days a week. For even greater convenience, we have laboratory capabilities, pathology, and high-resolution 4-D ultrasound on-site. To meet with a Long Island gynecologist or other experienced practitioner in Levittown, request an appointment using our online form or by calling (516) 731-9000. We offer same-day appointments for urgent conditions, and offer appointments on evenings and Saturdays. Saturday & Sunday: 9 a.m. to 1 p.m.
Our Levittown location is located within 3 miles of Bethpage. You will find us at 2950 Hempstead Turnpike, one-quarter mile east of the Wantagh Parkway. We are located on the south side of Hempstead Turnpike, between Dunkin Donuts and CVS. Our doctors, nurse practitioners, and physician assistants strive to make you feel at home, with high-quality care in a supportive environment. We treat a range of gynecology conditions, perform annual check-ups, provide personalized maternity care, and are specialists in minimally invasive gynecologic surgery. Physicians of The Woman’s Health Pavilion are proudly affiliated with the Northwell Health System. Travel southbound on the Seaford-Oyster Bay Expressway (Route 135). Take exit 7W to merge onto Hempstead Turnpike (Route 24) westbound. On Hempstead Turnpike, you will pass St. Joseph’s Hospital and Shop-Rite on the right before crossing Hicksville Road (Route 107). Continue traveling westbound on Hempstead Turnpike past Tri-County Jewelry Bazaar. You will see our office on the south side of Hempstead Turnpike before reaching the Wantagh Parkway. We are directly across Hempstead Turnpike from P.C. Richards, between the CVS and the Dunkin Donuts. To access our parking lot, you will need to make a U-turn on Hempstead Turnpike, either at Division Avenue (near the 7-11) or at Shelter Lane (across from the Levittown Veteran’s Memorial).